When World War II broke out in Europe, the American army had no specialized division of mountain soldiers. But in the winter of 1939–40, after a tiny band of Finnish mountain troops brought the invading Soviet army to its knees, an amateur skier named Charles Minot “Minnie” Dole convinced the United States Army to let him recruit an extraordinary assortment of European expatriates, wealthy ski bums, mountaineers, and thrill-seekers and form them into a unique band of Alpine soldiers. These men endured nearly three years of grueling training in the Colorado Rockies and in the process set new standards for both soldiering and mountaineering. The newly forged 10th Mountain Division finally faced combat in the winter of 1945, in Italy’s Apennine Mountains, against the seemingly unbreakable German fortifications north of the Gothic Line. There, they planned and executed what is still regarded as the most daring series of nighttime mountain attacks in U.S. military history, taking Mount Belvedere and the sheer, treacherous face of Riva Ridge to smash the linchpin of the German army’s lines. 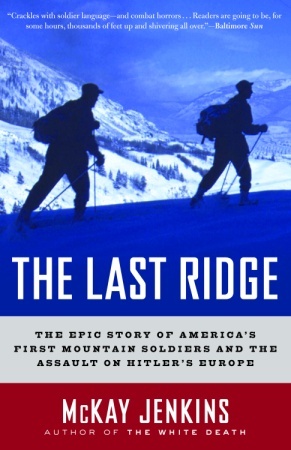 Drawing on unique cooperation from veterans of the 10th Mountain Division and a vast archive of unpublished letters and documents, The Last Ridge is written with enormous warmth, energy, and honesty. This is one of the most captivating stories of World War II, a blend of Band of Brothers and Into Thin Air. It is a story of young men asked to do the impossible, and succeeding.